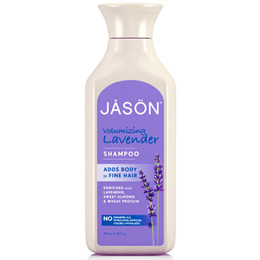 Jason`s pure, natural Volumising Lavender Shampoo gently cleanses fine, limp hair, adding lift without dryness. Natural botanical lavender and sweet almond extract weightlessly strengthen and fortify hair while wheat protein amino acids add all-day volume. With renewed body, bounce and shine, your hair is noticeably uplifted. Aqua (Water), Cocamidopropyl Hydroxysultane, Sodium Cocoyl Isethionate, Glycerin, Sodium Laurylglucosides Hydroxypropylsulfonate, Aloe Barbadensis Leaf Juice*, Calendula Officinalis Flower Extract*, Camellia Sinensis Leaf Extract*, Chamomilla Recutita (Matricaria) Flower Extract*, Chenopodium Quinoa Seed*, Citrus Grandis (Grapefruit) Fruit Extract*, Equisetum Arvense Leaf Extract*, Lavandula Angustifolia (Lavender) Flower Extract*, Ascorbic Acid, Tocopherol, Alcohol*, Babassu Oil Polyglyceryl-4 Esters, Benzyl Acetate, Camphor, Citric Acid, Guar Hydroxypropyltrimonium Chloride, Hydrolyzed Sweet Almond Seedcake, Linalyl Acetate, Linoleic Acid, Linolenic Acid, Panthenol, Sodium Chloride, Terpineol, Triethyl Chloride, Terpineol, Triethyl Citrate, Benzyl Alcohol, Potassium Sorbate, Sodium Benzoate, Linalool. *Certified Organic Ingredient. Gently massage shampoo into wet hair and scalp. Rinse and repeat if desired. 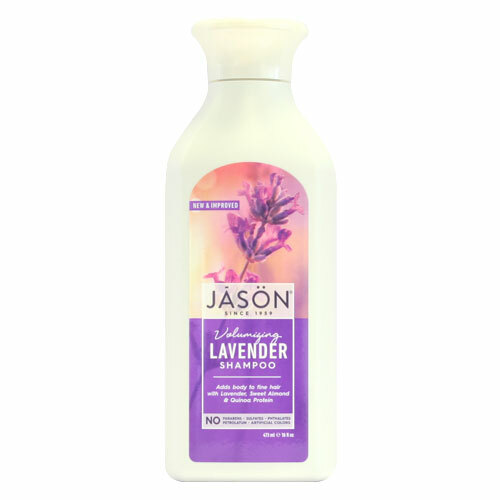 Follow with Jason Volumising Lavender Conditioner. Below are reviews of Jason Volumising Lavender Shampoo - 473ml by bodykind customers. If you have tried this product we'd love to hear what you think so please leave a review.